Warning! This one is kind of a pain in the neck…but it’s totally worth it. 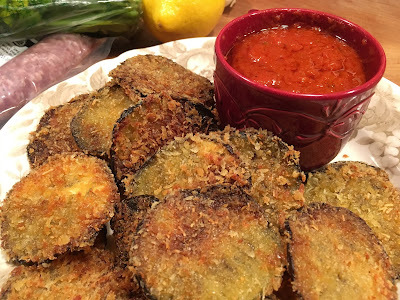 Preheat the oven to 400 then thinly slice a medium eggplant cross-wise, use a sharp knife so that your slices are no more than a 1/16 of an inch thick. Set up a breading station with a bowl of lightly scrambled eggs and another bowl with a four to one ratio of panko to grated pecorino, salt and pepper are never a bad idea either. Cover the entire surface of two rimmed cookie sheets with long heavy pours of olive oil. Individually dip the eggplant slices into the egg, followed by the panko mixture, making sure to press the slices down firmly so the breading sticks well to both sides. Lay them out in a single layer on the oiled cookie sheets and bake for approximately thirty minutes. Flip once halfway through and rotate the pans to minimize the chance of burning the edges. While those are cooking sauté a few cloves of minced garlic until translucent then add a jar of your favorite marinara sauce and simmer. Drain the crispy eggplant slices on paper bags before serving with the sauce. And no worries about leftovers, they’re great the next day in a sandwich or salad.